Best Surf Guide You’ll Ever experience! This is already my 3rd time surfing with Bali Surf Coaches. You can expect professionalism, dedication, and passion from Sadia, Alit and his team. I have gone from Beginner to Intermediate within 7 sessions of surfing with Sadia, he is a very wise and experienced surfer. He knows Bali waters unlike any other and he ensures your safety from the beginning til the end. Your confidence and courage grows with each time of surfing. 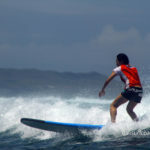 Not only that, he will bring you to the best surf spots in Bali suited to your Level of surfing. I could guarantee your every surf session will be an incredible one with Bali Surf Coaches! Awesome surf out at airport lefts, right and some others surf spot in Bali . Picked up from villa and we heading each deference surf spot on each day with they are local knowledge and forecast. sometime taken out to the break on a boat, that the one my favorite not need to paddle hard after catching the waves ..because at out side reef in general they are have big and wide channel. which make easier for us if we don't have enough energy to paddle out again. Alit and Sadia told us about the spot, lead us on the water and got some photos of everyone surfing, sadia alit they are great surf guide and coach. Great surf coaching and Lessons. Alit, Sadia and teams provided me with some great intermediate surf coaching. They helped me progress and gave me lots of direction. We did a couple of breaks including airports, which was great to get a little boat too and meant it was easy to make photos, which they load up to FB for free. The sessions we did were more than long enough and the collections / drop offs from my hotel were on time. Too easy. I spent two weeks with Sadia and Alit. We surfed just about every day and every day was a new and wonderful experience. From reefs, to beach breaks, to offshore reefs. Sadia and Alit are great...as surf coaches, surf guides and more importantly as people. They will take you where the waves are right for you. They will push you if you want to be pushed to get better. They will respect you if you want to chill out on the waves that are comfortable for you. And they will teach you about Bali life. They have the respect of all the locals at all the breaks so you don't need to worry about localism. This matters a lot when waves are limited and surfers are plentiful. They were fantastic with my daughter when she was with me - teaching her how to surf and teaching her about the ocean. Sadia and Alit, thanks for some fantastic surfing, all the great laughs, and lasting memories of surfing in Bali and you representing the wonderful people! I can't say enough to tell the world how great you guys are and how much fun I had. "One of the best...there is in Bali"
One of the finest Balinese guys i know and consider now a very good friend, we arrived in 2 weeks ago to Bali, and whilst i have been to many Bali over 30 times, it was great this time whilst traveling with Family to have a top guy like this, to take me too the best spots on the days i wanted to surf. Oh and lest not forget the countless amount of Surfing photos to take home. Im back in April 2018 and i will no doubt be hooking up with these guys yet again. 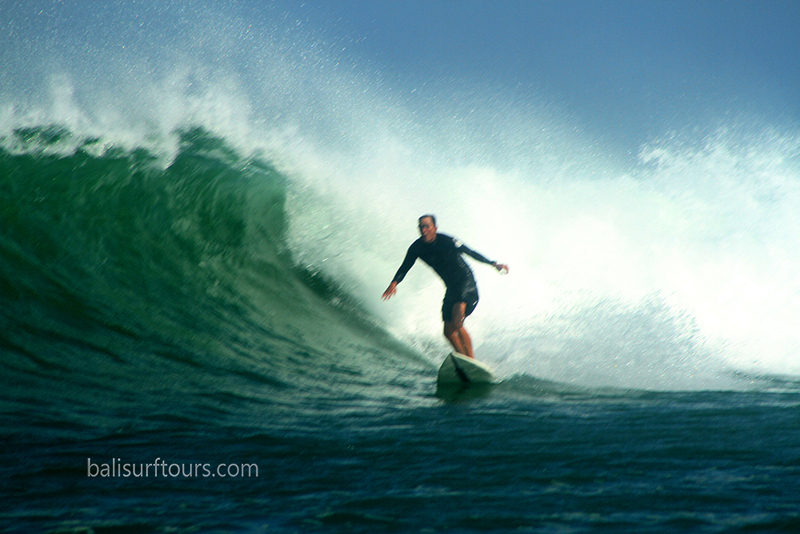 Ask Darren about Bali Surf Tours. http://facebook.com/ daz.white.982. I got picked up from the airport by Alit, an experienced surf guide, and got transported to Airport Reefs where a local boat was waiting. They took me out to an awesome point break and showed me how to navigate the overhead swell, where the channels are, etc. I got in some nice lefts that got me super stoked. Surf for a couple hours, got back on the boat, came back to land and chilled with Sadia and other surfers over a couple beers and great conversations. Sadia took nice pictures from the boat and sent them to me so I can show off to my wife and friends. Went to another spot the next day and got some nice surfing in again with tour guides Kadek and Sadia. Same thing next day, and the day after that. 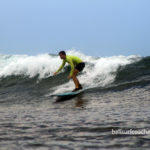 That was my awesome Bali surfing experience with Balisurftours. I recommend them wholeheartedly. Professional but also very friendly which made me feel relaxed and confident. Safety and hospitality are their upmost priority. 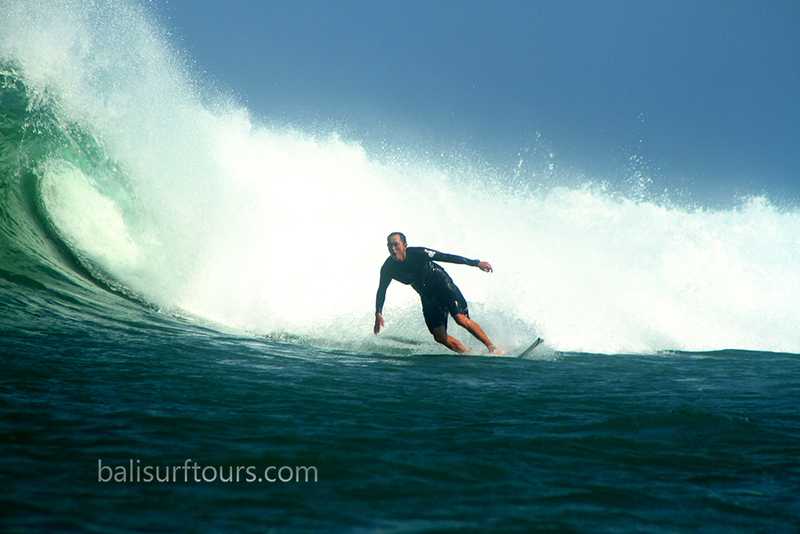 Their knowledge and experience on surf spots will make your surfing adventure most enjoyable and memorable. I introduced a couple of my mates to surf with Sadia and Alit and they loved it. We will be back. Thank you Sadia and Alit for the laughter and great banter, and of course the awesome surf. Sadia and Alit have an in depth knowledge of the local breaks. They will make finding good waves much easier. They also help you into waves which is fantastic. Best guide in Bali. "Professional, skillful, and fun Real Balinese local knowledge..."
Sadia was a very professional and knowledgeable guide. He had me up and riding in Bali in no time. We hired him for a surf trip in July 2017. My husband is a good surfer and had been to Bali many times but I have only been surfing for about 7 years and had never been to Bali. Because the waves in Bali can be big and heavy, I did not feel confident and wanted the local expertise to help and encourage me. Sadia and Alit were friendly and made sure I had a great time....and challenged me as well. They gave me their undivided attention and ensured I was safe. They both spoke English and were able to communicate well. Also, Sadia knew many people in the line-up and was able to get me into waves with priority. You can tell that Sadia was born and raised in the water around Bali. If you are lucky he will make surf photos for you sometime depending on the surf sport we go regarding with his lens, This photos from boat trip out side reef took by his camera. Thanks sadia for the photos. If you want to have a waterman who can share Balinese culture and take you surfing, I wouldn't hesitate to contact Bali Surf Tours. "Local guide Balinese is the way to go..."
There is nothing better than benefiting form local experience. Especially when you are in a foreign country. It is the second time I have used Bali Surf Tours and have found them very good. I was taken to the best break for my level of surfing. Advice and direction was given on where to enter the break and where to sit to get the waves that would suit me. This is essential when you have never seen the break before. We visited several places to surf and there was always a light hearted atmosphere during the day which makes for a good experience. I got to visit ketut's house and given a Bali coffee. A great experience I really enjoyed. The country side around Canggu is beautiful. A real change from the Bukit peninsula. All the guides I met have been professional and knowledgeable. Always ready to help in or out of the surf. Thanks to all the guys. "Surfing With Bali Surf Tours..."
I surfed 10 days days in a row with Sadia.... Really cool guy, knowledgable and we surfed a different spot every day! He found spots that suited my level and style , and is a great guy to surf with too! On the last day I didn't have much time as I was flying out, Sadia and Alit took me out and we surfed three different breaks on the reef, and scored each time! They encouraged me into the right take off spots and made sure my wave count was good! These guys are honest and reliable, and g with them takes all the stress of finding your way around and the best spot on the best day is made easy! And he is fantastic! Always on time, super friendly and knowledgable , if you book , ask about accommodation too,.. He has a lovely place with great conditions in the caangu region,... Which is still part of the real traditional Bali..... I will always book future trips with him,.. And can now call him a good friend too! Thanks Sadia! Love your work!!! I have surfed with Sadia from Bali Surf Tours about 10 times now and he and his crew, Made and Alit are amongst the most friendly and happy people I have had the pleasure to met. They are punctual, respectful and always glad to see you. They brighten up your day with there enthusiasm and passion for surfing. Sadia and crew will first establish your surfing ability, then establish what kind of waves you want to surf, then recommend a surf break to suit your needs. No matter what your surfing ability is, experienced or novice, they will find a suitable spot to get the best waves on that day. They pick you up from your hotel, transport you to the surf break, explain the dangers and how the waves are breaking that day, then paddle out with you in the water. At no time do you feel unsafe or alone, they even talk to the other locals in the water and encourage them to move on. On my last trip in February 2017 we surfed at Airport Left and Right, Canggu and Pandawa Beach. At the Airport we took a boat out to the reef which anchored in the channel and it was only a short paddle to the break. Sadia and Alit took photos of us surfing, creating great memories of our trip. It is always a pleasure to meet the crew at Bali Surf Tours and I look for to our next trip to Bali where I will certainly be surfing with my friends at Bali Surf Tours. My teenage daughter and I went for two surfing sessions with Sadia and Alit. The experience was great and we had a lot of fun riding decent waves. Sadia is able to select the right location to match the ability of the surfer. We have also taken very nice photos that captures the moment of us on the waves. Thank you for the unforgettable experience! This was my second trip with Bali surf tours and even better than the first. I surfed 8 days straight and every session had unique and fun waves. Again, Sadia and his team were professional, always on time, and took me to the best available waves which suited my ability and also challenged me. They not only helped me to get great waves but also to improve on my technique and knowledge. It was also great to learn about the local culture and customs as well as giving and getting respect on the waves. I will come again soon and for sure will hire Bali Surf tours for everyday of my stay. Amazing friends I know will I will have for life, thanks again guys. "Great Day surf tours with Sadia and Bayu..."
I just had a quick work trip to Bali and used Sadia to take me for a couple of early morning surfs. This was without doubt the best decision I could have possibly made. Sadia picked me up; brought a couple of boards for me to choose from; and took me somewhere with awesome fun waves. It was all so easy and uncomplicated. In the water Sadia looked after me and made sure I was always in the right spot when sets came thorough. Sadia knew all the other local surfers in the water, so it felt just like going surfing with a group of friends. I got some awesome waves but more importantly Sadia made each surf session an experience - he introduced me to his friends, taught me about Balinese culture, and told lots of interesting stories about his life in Bali. I will definitely use Sadia when I'm next in Bali. Ian S - Visited January 2016. 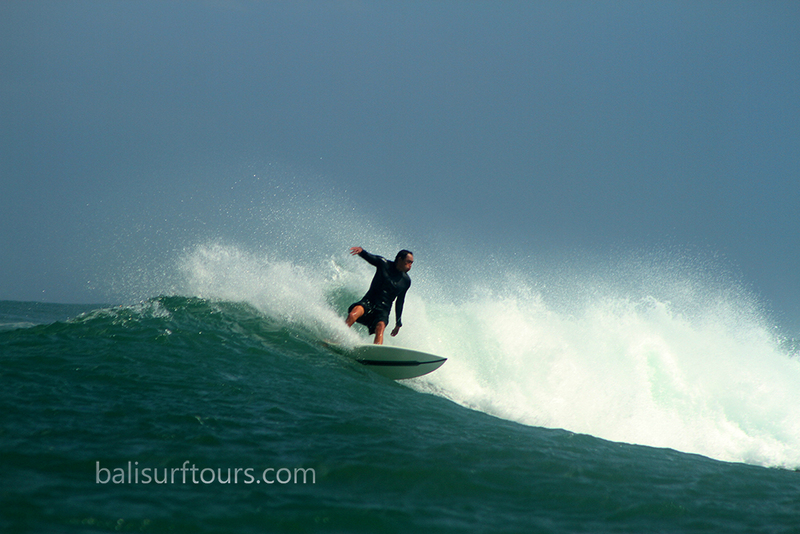 If you want to have a great experience in Bali, do not hesitate to choose Bali Surf Tours and Mr Sadia. We came here for two weeks and almost every day went with Sadia on different spots. He picked us up and brought us back home. Boards and car are included in the price, which makes this service very good! My wife found these guys last-minute on our honeymoon and what a find. Wow. He had his nephew roll all the way out to Nusa Dua early to grab me. They were there early and ready with a nice longboard and very welcoming. He and his crew are super positive and pump you up in the water, pushing your abilities and helping you charge the bigger sets. I only had one day to surf but we were in the water for 4-5 hours. He knows all of the locals in the water so the vibe is good. He also snaps a few photos with a nice SLR camera. Been surfing for 20 years and it was the best surf day I've had in over a decade. Not just the waves, which were awesome, but the whole experience. Next time let's hit the left! I know, I know...ladies first;) I'll be booking these guys when I come back. "Best people to learn surfing in Bali"
"Book these guys you wont regret it...!" It was my first trip to Bali and as an intermediate surfer I was nervous about my ability to catch waves there. So I decided to hire a surf guide. It turned out to be a great decision. Sadia and his boys took me to some great waves and showed me how to surf better and protected me from local crowds. Very Professional and honest outfit and fun with Sadia and his boys. Always on time and smiling they made my trip so enjoyable. I had a week in Bali after a work trip, while waiting for my family. I wanted to score some good waves but not worry about entry/exit/hassles/reefs/tides etc as I was alone & it was my first trip to Indo. I wanted a guide more than a coach & I met my now good friends & bro’s Sadia & Alit through their website. I explained my situation saying I wanted to surf a lot & learn about Balinese culture, but stay away from tourist hotspots, and avoid partying all night in Kuta! No problem they said & no problem it was! The only time we didnt score waves was when I hurt my foot. Every other day was rising with the sun, thanking Alits mountain god for watching over us in the water, banana, rice & coffee breakfast then off to the waves! Depending on swell & your ability there was always a good choice as big or as empty as you want. Photos included! After a full 3-4hr session & good feed of babi guling!, the rest of the day was spent exploring their local beach/area on foot & on moped, a craaazy experience! Then chilling with his family, trying the fruit off his trees while discussing life & kharma, or a sunset surf with his kids at his local beach (if u have energy) then off to a local restaurant or a moped ride to echo beach for a drink & if you want, meeting other travellers. I was lucky to have dinner made for me by Sadias wife a few evening’s. WoW! So good! ! These guys will do as much or as little for you as you want. I fell in love with Bali & its people. Such a hustle bustle place with people that have pure serenity at heart & a close relationship with the ocean. If I lived somewhere with waves like this & every surfer came to take them over, I don’t think I could be as accepting as these guys. Truly humbling. Everyone knows Sadia & you should too. The ocean is their life & they welcome you into it with open arms. I will return with my family next time….. when I can afford the airfare! Go see these guys if your a surfer or not, a beginner or pro. Theres a warm feeling for everyone! If your surf fit, with Alit & Sadia calling you in, you’ll be on fiiiiire!! So happy I went with Bali Surf Tours. I didnt have much time to plan, however felt very comfortable going with Sadias company. Its a locally grown company and I was hoping to get more out of this trip than just surfing, and I got just that. I wanted to see the real Bali and I got just that. I had the perfect accomdation outside of the mainstream tourist area, at a beach visited by mainly locals coming to enjoy sunsets and pray. Sadia is a big part of local surfing culture and knows all the breaks. When there were waves we scored and when it was small I scored because I learned so much about local modern balinese life and culture. If you come with an open mind you will be rewarded. For the open minded solo surfer, this is money well spent. Im an intermediate surfer and they pushed me to excel. For those just learning, I cant think of more competent surfers that are truly there for you. I feel very fortunate to have met Sadia, Alit, his family and all the friends along the way. Bali surf expedition accomplished!! I had a week’s worth of lessons with Bali Surf Tour between 30th June – 6th July 2015 and worked with Sadia, Alit and Made. I made my choice to use the team after receiving several strong recommendations from friends and family, who only had good things to say about them. After speaking with Sadia over the telephone before coming to Bali, I started with a 2 day trial, before extending by 5 more days. I would strong recommend the team to other visitors to Bali, regardless of their surfing ability. I am close to beginner in ability, although I’ve seen that the team are able to provide guiding services up to expert level – Sadia has competed in surf competitions across Bali and offers specialized guiding sessions for clients looking for the big stuff: I saw them take clients out to Serangan, Uluwatu, Balangan, Nusa Lembongan, etc, at 3,4,5x overhead and barreling… Similarly, I’ve seen that they can teach complete beginners effectively too. Boards and all other equipment are provided if you don’t have your own and all you need to bring is a towel, your board shorts/ swimming costume, and some sun cream. I was picked up every morning at my hotel at a pre-arranged time and we went to whatever spots my teacher (predominantly Alit) thought was suitable for the day. There was no preference to go to the same spots as on previous days and we visited a variety of locations along the West coast – Airport Reef, Toro Toro, Berawa, Canggu, Green Ball, Padma, etc. We drove around beforehand, got out and reviewed how crowded it was, how big the waves were and what the tide was. If somewhere didn’t look good, we got back in the car and looked for something new – there was no rush to get the lesson over and done with, just a focus to find the most appropriate spot for me. The modus operandi of the team is to go to places where you will be challenged and push yourself to improve, all within a framework of safety and where client feels comfortable. Once or twice I said I didn’t feel comfortable because it was either too big or a bit crowded, and so we paddled into the channel to get away from the breaking waves and the crowds, and had a bit of a debrief. If I still didn’t feel great, we decided to move on elsewhere. This is a highly professional outfit and it was clear that the team want to develop lasting relationships with their clients and see them improve. As locals from Bali, they know all of the spots on the island back to front and it feels like they are completely in charge in any situation. The other locals in the water know them and respect them and are happy to share waves with you. I detected no agro in the water and had fun in all my sessions. If you are in Bali and want to improve your level of surfing, I honestly wouldn’t look further than Bali Surf Tour. After having a number of harrowing experiences going out with my brothers in the past (both were sponsored surfers when they were younger) and less than perfect experiences at a number of well-known surf camps in Bali (3-4 across the Bukit, Canggu, and Legian, which I won’t name…), this week was really very refreshing. I’m looking forward to coming back to Bali and meeting up with the guys again. Please feel free to message me directly for any more details. Never practiced surfing before coming to Bali, but with Bali Surf Tours and Sadia we made it! Me and my girlfriend learned how to catch small waves during our 9 days of surfing lessons, day after day we became stronger and more confident. Sadia was taking us different spots depending on the wind and water conditions. Was very convenient that all equipment and transportation were included! Very satisfied with our experience and cant wait to come back! I have just returned to Australia after an absolutely awesome 15 day surf trip to Bali during the month of November. I utilised the services of Bali Surf Tours (Ketut and Alit) for this entire period and really enjoyed myself. The daily routine consisted of at least one of the boys picking me up around 7am – we would go to where the guys thought that surf would be pumping for the day (which it always was) – usually in the water around 8-830am. We’d then surf for 2-2.5 hours. The guys were more than happy for me to surf for longer than this, I had a few days of surfing 3-4 hours. We had a few days in secret spots where we were the only surfers in the water! Post surf we’d grab a feed at one of the local warung’s and then get dropped back at my hotel by early afternoon. One of the non-surfing highlights of the trip was trying all the local delicacies with the boys ( Lawar Kuwir, Ikan Bakar & Babi Guling). I was looking for a pure surfing holiday where I didn’t have to go through the hassles of renting cars / drivers or motorbikes and then having to figure out where to go to surf. My trip with Bali Surf Tours fitted the bill perfectly. I had great company, cranking waves and a wonderful time. I’d definitely recommend them to anyone looking to surf in Bali. 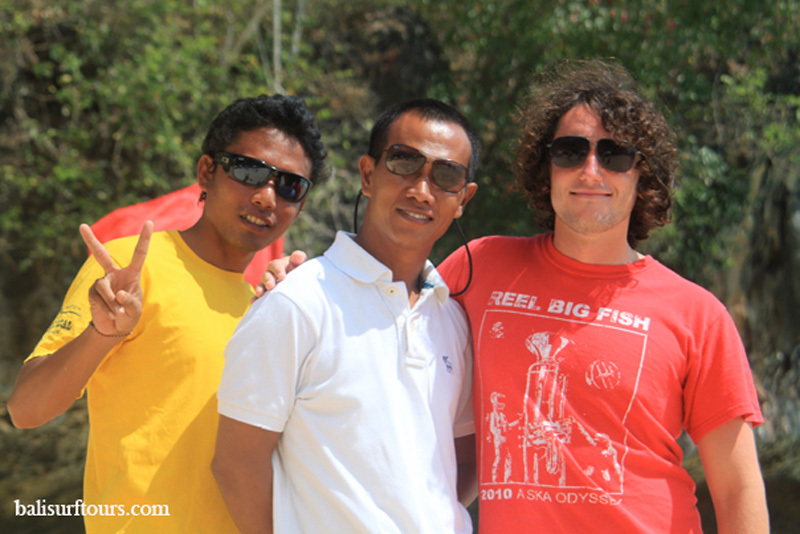 The friendliest teams and most professional surf guides and coach, you will meet here on Bali. Be careful of the other surfing cowboy companies!Being locals and over 20 years experience they know all the best places, the tides, breaks, secluded spots for ANY LEVEL OF SURFER. Sadia and his team organise most of the big surf competitions and even the Mayor of Denpasar recommends Sadia and his team. Book them..dont delay..they are popular & the best in Bali. Tip – dont try and reduce his price, this is a local professional team…support the community, smile and you will have a lot of fun! 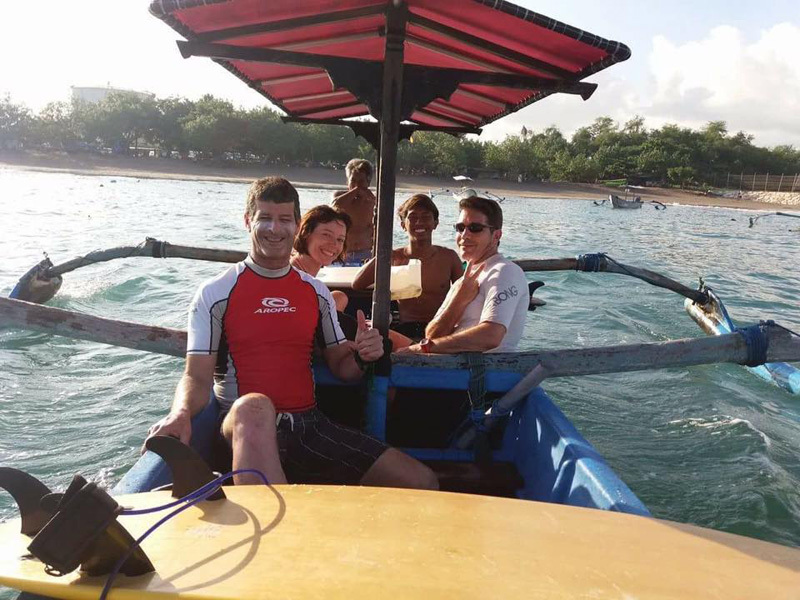 I have become a regular traveller to Bali 10plus times in the last 3-4years and since my very first trip i have used Bali Surf Tours to guide me around Bali and its many surf breaks! I highly recommend using these guys…. It always amazes me the local knowledge that these guys have and share to ensure that we are surfing the right break at the right time and also matching it back to my ability to ensure the trip is a safe one yet what I’m looking for… for me that is pushing myself into bigger waves as my ability gets better and as always looking for the barrels. Yesterday we scored 6-8ft Turtle Island and was an absolute blast, Thanks Sadia, Made, Alit and the crew… looking forward to the next surf – Lets go! I have been to Bali 3 times and the first I thought I would discover all the breaks on my own. Then I realised I needed local knowledge, if you want pumping waves he is your man and his staff. I used them again in April and some spots were flat but he knew where to go and I got pumping waves again while if on my own would not have surfed the whole week. If surfing is your passion and you are with the family or mates I highly recommend this company you will not go wrong. Our trip to Bali was fantastic mostly because of Sadia, Made Windu, and his entire surf guide team! I am a 50 year old intermediate surfer with 3 kids (ages 14, 14, and 13) who are beginner / intermediate surfers from Carlsbad, CA – USA. From the moment we met Sadia for our first session, he was extremely nice, knowledgeable, and great to have has a friend / coach in the water. The kids had someone with them the entire time and I appreciated Sadia’s “coaching” of the kids as well as his commitment to safety. This also allowed me to surf without the worry of the kids getting into trouble. As I am writing this, we have two more days booked with Sadia and can’t wait to get back in the water with him and his team. The memories I have surfing with my kids and Sadia will last a lifetime! 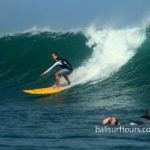 I would strongly recommend Bali Surf Tours to anyone looking for a Bali surf guide whether experienced or just beginning. I came all the way from El Salvador and let me tell you that surfing with Sadia and his teams is a one of a kind experience! Not only is he a excellent surfer himself but an amazing coach that always has the perfect thing to say to improve your surfing. He constantly hits the nail giving you great tips using fun analogies that makes it easy to remember. He is a respected surfer within the local community and always knows the best spots and when to hit them to surf the best possible conditions and avoid the crowds. Altogether he is a great person and a great professional that surrounds him self with excellent instructors. I highly recommend Bali Surf Tours. I not only improved my surfing by hitting very different and incredible secret spots but also left with amazing new friends. Most fun I ever had. Muchas gracias amigo! Wow…what can I say this was my first experience to Bali and I went there for work, but was able to. Enjoy a little surfing while I was there. Before I left I touched base with a good friend of mine who has been to Bali in the past and highly recommended Bali Surf Tours. I’m so glad he did! My experience with Sadia and his teams. Was fantastic, he is local and knows all the breaks very well and the challenges that could be faced while surfing in Bali. Size of surf, tide and wind…in the case of my trip it was the size of surf that was the challenge…double over head + the first day and I did not want to experience my first day in Bali with a trip to the hospital. Sadia was able to find a spot tucked away from the major pulse of the swell, so I could get used to this new experience. Sadia was extremely prompt on being at my hotel in Nusa Dua well in advance, so that we could get on our way! I did not bring my own board and he had quality boards that I was able to enjoy for my level. In my trip I enjoyed surfing Jimbaran, Dreamlands and Airport Lefts…this was by far my favorite spot we enjoyed…we took a boat ride out to this break and the boat stayed with us the entire time we were in the water, which made us feel safe and a place to stop for water and rest if needed. If you are planning a trip to Bali, I highly suggest you contact Sadia before you go, so he can confirm time to spend with you while you are there. He can also provide recommendations on where to stay based on your surf ability, hotel budget for the time of year you will visit Bali. His warm personality is a true testament of the people in Bali and who he is as well! Thank you Sadia for making my surf experience in Bali the best I have had anywhere in the world!!!! To Sadia, Wayan, Made and Bali Surf Tours Teams. I just wanted to say thank you for taking me to the next level! Spending a week with you guys made Bali a special place. Thanks for teaching me about Mother Ocean and how to get love from her. I would recommend you to any level of surfer wanting to improve and be guided by locals to great spots. You all have passion and love for surfing and it shines from you! Thanks for the good times, great photos and for taking me to my first reef break!! See you next time my friends. I spent two days with Sadia, and his team just on the first day, Made was really lovely and very helpful and his photographer took some great photos! Each day was only around 5 hours for 65US but I still enjoyed the two days. Sadia was very attentive, always with me and advising me where to align myself on the wave and pushing / paddling me onto some of the waves to get me started. He was very helpful in understanding mind over matter and realizing the size and wave is not the enemy but is your friend and once you understand how each wave and break works you can work with it too and have the best waves of your life! Also, he emailed me straight away with the pics I didn’t even have to follow up with that! Thanks Sadia for a really great time. My 4 private surf lessons and sight seeing tour with Sadia and his team at Bali Surf Tours were the highlight of my recent trip to Bali. From the beginning, Sadia and Alit took me under their wing and were extremely professional, friendly, courteous and helpful in every regard. Sadia is an excellent surf coach. I’m very grateful to Sadia for teaching me how to surf and to understand the physical and mental requirements of surfing; along with where my own strengths and weaknesses lie and key areas for improvement. As a surf coach Sadia is a great motivator and he challenged me to push myself to progress to the best of my ability. Within only a few lessons, I was thrilled to be standing up and riding some nice Bali waves. I have no doubt I couldn’t have progressed as far, within a relatively short time, without Sadia’s instruction and coaching. Aside from surfing, Sadia is passionate about Bali and along the way I learnt a lot about Bali places, the culture and the Balinese people and way of life. The fun and informative sight seeing tour to Ubud was a real treat on the day the waves looked just a little too rough! I highly recommend Sadia’s services as a surf coach, sight seeing tour guide, or surf guide for more experienced surfers who want to be guided to the best waves Bali has to offer. Thanks again Sadia and Alit and I will definitely be coming back to Bali and sincerely look forward to catching up with you guys again in the future. Sadia and his team is an awesome Balinese local surf guide and surf coach, who knows heaps of surf spots in Bali and knows when they work with what conditions are around. Sadia, Made, and Alit Nala Kerisna are a great bunch of guys, and he is always bring his own Camera to shot every our trip. I have used Bali Surf Tours many times and they always take me to the best locations. You can’t go past Sadia and his team at Bali Surf Tours if you are a surfer looking for quality waves without the hassle of getting to the right break at the right time and removing the guess work of trying to locate the spots that are firing on the day. Sadia took my whole Bali surf experience to a much higher level than I could have ever achieved on my own. His local knowledge in and out of the line up was invaluable. As our holiday in paradise was only for 8 days, I wanted to maximise my Bali surf experience to the full and this is where Bali Surf Tours was a perfect solution. My objective was to surf epic waves each day, being completely stoked with no worries or hassles. Sadia and his team made this happen and exceeded all my expectations. Sadia is great guy, an expert surf guide, surf coach and professional in his approach. We have already booked our next trip with Bali Surf Tours and fully recommend Sadia to any surfer (with non surfing partner) wanting to experience Bali waves and Balinese culture. Just arrived back home from Bali and I would like to thank “Bali Surf Tours” for the great time!!! Both surfing and sightseeing tours were great. Made, our guide, was sharp on time every morning and made we feel welcome and comfortable throughout the whole trip. We surfed different breaks based on the conditions each day and the team was monitoring it all the time. The team speaks very good English and is very knowledgeable on both surf conditions and on the area. We will definitely use his services again for future trips to Bali and would recommend him anytime. Well done boys!!!! Keep the good work and keep surfing!!!! See you guys next year!! I had spent a considerably amount of time researching surf guides/coaches prior to my trip in October 2012 and after a number of different responses from both large and small operators, I booked with Sadia and the crew at Bali Surf Tours Unlike the other surf tour groups Bali Surf Tours offered a more intimate and personalized service as it was tailored to my specific ability – from the prompt and on-time pick-ups to the drop-offs at the end of each session, Sadia and the team were always easy going and professional in their approach. The wealth of local knowledge about all the breaks and surf conditions that the team has made a real difference, as it was suited to my ability and confidence level – and we all know ‘that feeling’ when paddling out into a new and unfamiliar break. I learn a lot about my surfing – my strengths and especially my weakness and key areas for improvement – all the advice and guidance was well worth it. I would highly recommend Bali Surf Tours to all weekend warriors and anyone who wants to make the most of a true surf trip to Bali. Having been to Bali many times but only surfed the beach breaks at Kuta and Legian I was looking for a surf tour guide that could let me experience a true Bali surf trip. If surfing uncrowded perfect waves is what your after I suggest you contact Sadia and his team. I spent three days with Sadia,Made and Alit and enjoyed not only the great waves but also time spent with three good blokes. Sadia was able to find waves to suit my level of surfing and kept encouraging me to push myself. Sadia local knowledge not only gets you to the best waves but he also helps you make the most of your time..Thanks again, the photos are amazing and looking forward to another Bali surf trip with Bali Surf Tours soon. I am an advanced beginner/ almost intermediate surfer and as that surfing in Bali can be quite a challenge. There are so many spots you can choose from and finding the right spot, at the right time that also suits your skill set can be very confusing. I have been to Bali a couple of times before and went surfing by myself. 3 month ago, when I decided to go to Bali again I wanted to maximize the amount of surfing time and was looking for a local guide. I came across Sadia and that’s the best thing that could happen to me. Not only did he find the right waves for my skill set, he also found spots we could surf while everything else was actually flat. I experienced spots I would have never gone by myself as I thought they are too advanced for me. Beside the knowledge, Sadia and his team are great people, which are much more than local guides. They are friends and what is better than going out surfing with friends and having a good time? Someone on his website said: You can´t go pass Sadia and his team at Bali Surf Tours. He is right. Since the first time I have met Sadia, I have been back to Bali 3 more times and had some great adventures and an amazing time with Bali Surf Tours. I have used Bali Surf Tours many times. Ketut Sadia has taken me on both surf tours and also island tours, both by myself and also with my girlfriend. He knows his stuff. He is a safe driver and has a very safe 4WD, which is what you need in Bali. He is great company, and knows where to take you surfing based on your level of experience and is a great surf coach no matter what level of surfer you, beginner to experience. He will surf with you and help you get waves when crowded too which area a big plus. He also will take photos of you surfing etc which is great. I have referred Ketut Sadia to many friends and they have all given positive feedback to me about him and his services. If Ketut Sadia is unavailable he will arrange another tour guide/driver, which I have used before as well. His team is just as experienced as him! I only use Bali Surf Tours when I’m in Bali now. Really worth it compared to doing it yourself! I decided to go to Bali for the weekend during my business trip. Since it was my first time in Bali and I didn’t have much time, I decided to look online for a surf guide. Finding Bali Surf Tours and meeting Sadia was the best thing that could have happen for me on this trip. Sadia was always very responsive to my emails and his team was always on time on pick me up every morning. I felt very safe, comfortable, and ready to have fun. Sadia and Made were the nicest people anyone could meet. They took me to waves that were perfect for my ability level and give me tips/advice to improve my surfing skills. They cheered me on and coached me in the water. Also, as we drove through Bali, they would tell me a bit about the history and background behind places that we pass by. Overall it was an excellent experience. I recommend Bali Surf Tours to anyone who is just looking to surf fun waves, have great time, and learn a bit about Bali surf culture. Next time i am in Bali, I will definitely call on Sadia and his team again. I am a basic intermediate surfer or as I like to call myself “A professional beginner”. After reading carefully all the comments on Bali Surf Tours web site, I decided to book with them one day to start… just to try and to know if it was worth it … After spending this first day and having a great session with Sadia and his team (Made and Alit the Photography), I remained with them for all my stay in Bali. Sadia is not just a very professional “surf guide”, always on time with Made driving safely to the spots, having a deep knowledge on the breaks – knowing exactly where to go and when to go, finding always waves and the best ones for my ability – he has even be more than a surf instructor: a real surf coach, helping me to improve my surfing and also confidence…the last session was epic ! I wanted to say that Sadia and Made from Bali Surf Tours made my trip to Bali better than I could have ever imagined. I have never traveled to Indonesia nor ever surfed over a reef before, but Sadia and Made helped guide me through the tricky breaks of Bali. Your insight into the Balinese way of life opened our eyes. I felt sad to leave this magical place on earth. I will miss our new friends! 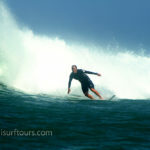 I booked Bali Surf Tours in July 2011 for 2 days. It was important for me to make best use of the limited time I had in Bali to catch some waves. I needed to be guided straight to where to surf because I only had 2 days. I contacted Sadia from Bali surf tours The correspondance I exchanged by email with Sadia was prompt and clear. At the hotel he was right on time to meet me. From the moment I met Sadia until we departed, I felt very comfortable. Sadia was very understanding and accommodating of my needs and tailored the surf spots to my preferences and ability. He was great at communicating and we were able to understand each other well in English. I had a great time paddling out to the breaks and surfing with Sadia and his fellow guide, Wayan. Sadia and Wayan created a very friendly atmosphere out there on the water. I especially enjoyed the last day surfing at Canggu with only a few people. 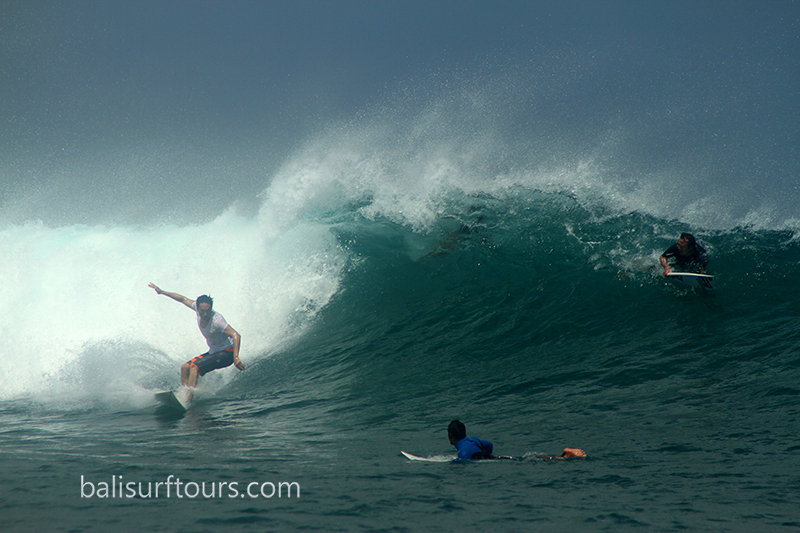 Without Bali Surf Tours and the guides, I would not have known where to start to get a wave. Through their local knowledge of the breaks and when to best surf them, I was able to enjoy what was available without having to make mistakes myself ie. landing on a hidden reef or rock. In between surfs I appreciated learning about Balinese culture and life.Sadia and Wayan – thanks for a fantastic experience and watching out for me. Thanks also for the pictures. (I’ve never seen myself on a wave before)I’ll come and find you when I’m back in Bali. I was fortunate enough to find Bali Surf Tours while searching online. After reading the past testimonials about Sadia’s surf tours, I felt really comfortable contacting them. Sadia was easy to reach by email, and quickly replied to all my inquiries and request. When the surf day finally came on our vacation, Sadia and his team member Made were on time to pick me up at my villa. He also invited my wife to come along on our surf trip (which she did). Sadia and Made came to surf with me. It was a nice clean day out at Canggu and we was surfed for about 3 hours! They are was great about informing me about the break, and encouraging me to catch as much waves as possible. 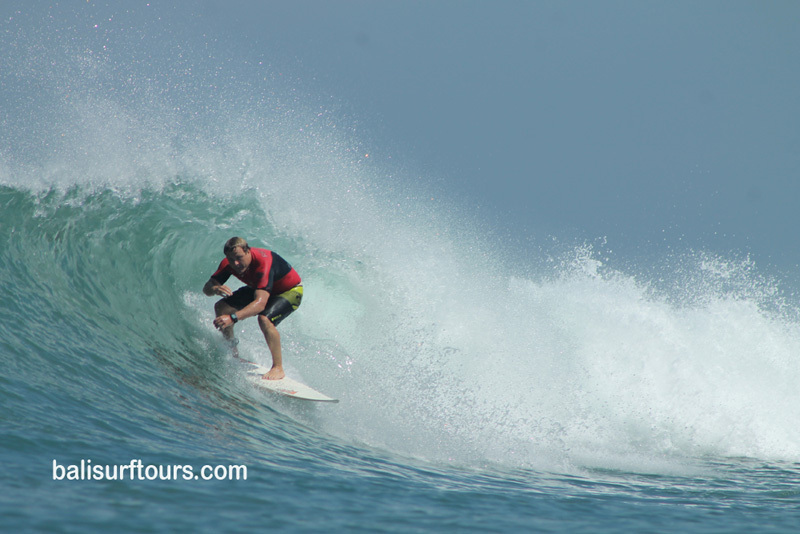 Bali Surf Tours gave me a great first time surfing experience in Bali! I will definitely be recommending their services to anyone in the future heading to Bali.